Does your garage door start to go up, but then suddenly stop? Or, is it exceedingly slow when it does? Both of these are signs that your spring is broken and the rest of the system is trying to deal with it. Without the spring, the door is far heavier and requires more force to get it moving. This could potentially damage the opener, so a safety system that some doors may be equipped with will kick in and cause the door to stop moving. Alternatively, with the latter scenario, your opener's motor is unable to reach higher speeds due to the weight of the door. If the cables of your door appear to be broken and splayed, the more likely cause is actually that the spring is broken rather than the cables themselves. This is because the broken spring in some cases will cause them to become disconnected from the rest of the system, hence flying all over and appearing to be severed. Should you notice that your garage door practically slams shut far faster than it regularly does, this is likely due to a busted spring. The system isn't used to dealing with the entirety of the door's weight and can't ease it down as it usually does. 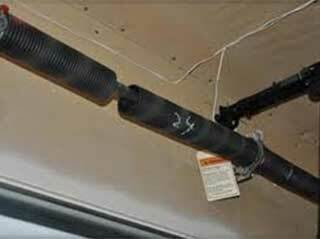 This is most commonly something that would occur with a garage door that has extension springs. This type of spring works by being stretched out to its limit in order to create tension, which translates into energy to get the door moving. It also means that it can snap from wear over the years, and part of it can ricochet and cause damage in the garage, thus creating a lot of noise. There could be many causes of your door not working at all, such as a broken opener, but if you use the emergency release rope and find it still doesn't want to go anywhere, then it's most likely the springs.